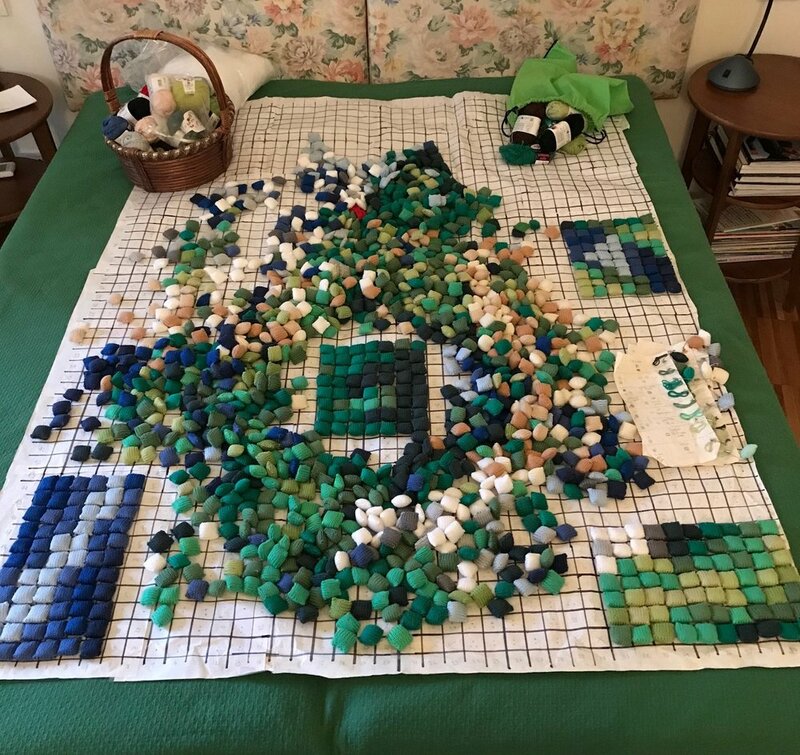 You might have noticed that there have been no updates for a while on the large mosaic puzzle which I am creating in knit. I had a break from it this winter. It is growing bigger; thus one of the only places large enough for such a grand d’oeuvre is on my guest double bed, and each time someone stay over I have to move it around. I have yet to sew the squares together, which means each time I move it I have to redo the full puzzle of the many coloured puffy squares. This weekend I finally decided to end the constant de-building and re-building of my “masterwork”. Time to sew the squares together one by one with transparent invisible thread. Oh my!… This is a much larger work than I anticipated. The first six squares to be joined with one another took me almost 20 minutes to add together, so there is a loooong road ahead of me. Despite it being a monstrous job, I have started to see the end of this mosaic piece, and I hope that you all soon will be able to see the finalized work in all its glory.